French Onion Soup has always been one of my favorite dishes…who doesn’t love the idea of toasted bread and gooey cheese, melted all over a hot and flavorful onion soup? But the traditional French Onion Soup recipe is not low calorie or Weight Watchers friendly. I’ve tried a few pre-made, low calorie versions that I’ve found in grocery stores but the taste is either blah or the portion is super small. So I set out on a journey to make my own, but also decided to make it as a casserole, just because I was hungry and wanted a meal that had some substance. It was so easy to make and the finished product was delicious! All the flavors I love but for less Points. And making it into a casserole was really easy. It just basically the soup with more onions and less broth. If you want to make this dish as a soup, just use more of the broth when making it. So simple, yet so perfect. And each very large serving is just 5 Points each. 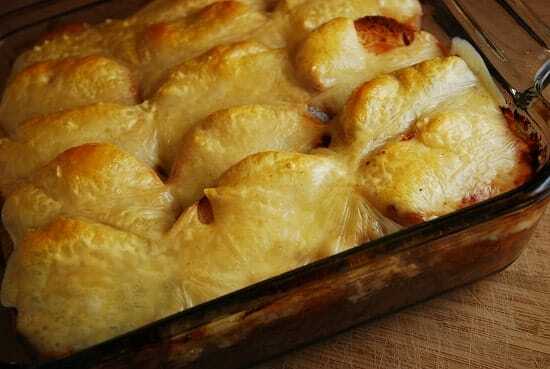 This low calorie French Onion Soup Casserole Recipe is perfect for warming up on a cold day. Enjoy! Followed exact directions. No problem with extra soup. This is Great! Thanks. Two thumbs up! Perfect! Followed all cooking times and it turned out great! About to assemble – but my onions seem like they’re too “soupy”. How much liquid should be in the onion mixture? How does this make 4 servings of 1-1/2 cups each with only 1-1/2 cups total liquid? Got very excited coming across this recipe only to find out it’s not actually vegetarian. I’m sure that vegetable broth would not make this taste the same. I just wanted you to know that I made this for my husband and myself this week and we both loved it. Thank you so much for the tip about using some broth to keep the onions from sticking to the pot, that was a real issue for me. Considering I cook for 1… how well do you think this would keep/reheat?? this sounds great. do you think you could make the soup mixture ahead of time and refrigerate then just heat up with bread, cheese, etc later? Sounds like a good idea! I think it should work fine…. This casserole should not be classified as vegetarian because it is made with beef broth and Worcestershire sauce which contains anchovies.. Easily remedied by subbing beef flavored veggie broth and anchovy free worcestershire …….but the last bottle of Worcestershire I picked up – no longer listed anchovies in the ingredients. Caramelize onions for 30-40 minutes? That is what makes it so yummy!!!!!. I always cook them slow on low heat, but this is the best recipie I have found. I dont have the individual crocks and it still taste the same! Sounds delish, but to clarify, you’d have to use veg broth for this to be vegetarian. Perfect for winter comfort food for those of us up in the northeast blue states. This is pure genius! If it wasn’t 8 AM I’d run and make it now…it may be on tonights dinner menu, though. Looks delish.